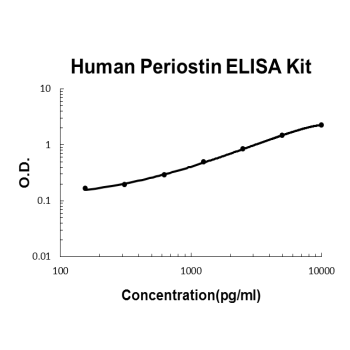 Sandwich High Sensitivity ELISA kit for Quantitative Detection of Human Periostin/OSF2. 96wells/kit, with removable strips. Widely expressed with highest levels in aorta, stomach, lower gastrointestinal tract, placenta, uterus, thyroid tissue and breast. Up-regulated in epithelial ovarian tumors. Not expressed in normal ovaries. Also highly expressed at the tumor periphery of lung carcinoma tissue but not within the tumor. Overexpressed in breast cancers. .
Golgi apparatus . Secreted, extracellular space, extracellular matrix . Colocalizes with BMP1 in the Golgi. .
Enhances incorporation of BMP1 in the fibronectin matrix of connective tissues, and subsequent proteolytic activation of lysyl oxidase LOX (By similarity). Induces cell attachment and spreading and plays a role in cell adhesion. May play a role in extracellular matrix mineralization. .
Periostin, also known as OSF2, is a protein that in humans is encoded by the POSTN gene. The International Radiation Hybrid Mapping Consortium mapped the POSTN gene to chromosome 13. Periostin functions as a ligand for alpha-V/beta-3 and alpha-V/beta-5 integrins to support adhesion and migration of epithelial cells. It is found that periostin was overexpressed by the majority of human primary breast cancers examined. After myocardial infarction, periostin-induced cardiomyocyte cell cycle reentry and mitosis were associated with improved ventricular remodeling and myocardial function, reduced fibrosis and infarct size, and increase angiogenesis. Question: If the immunogen is UniProt Q15063, which isoform was used as the immunogen? A: Isoform 1 was used as the immunogen for EK0985. Question: Are the capture and the detection antibodies immunized against the full-length protein? A: The capture and the detection antibodies are immunized against the full-length protein for EK0985.